Francis Grissell was the fourth son of Thomas De la Garde Grissell and his wife Frances Adelaide. Francis was born in 1886 in Mickleham and baptised at St. Martin’s Church, Mickleham. After being educated at Harrow, where he was a member of Newlands House he attended the Royal College of Art and was articled to Messrs Nicholson and Corlette Architects; renowned Church architects. Francis was elected ARIBA in 1913, and accepted a three year position in Hong Kong before returning to England on 26th June 1915, aboard the “Miyazaki Maru”. Francis Grissell made a bequest to the Royal Institute ‘to be used for the benefit of the library’ before leaving England. Initially he enlisted in the Artists Rifles, which in 1915 effectively became an Officers Training Corp. Later the same year he was commissioned into the Coldstream Guards (4172). At the beginning of September 1916 the 1st Battalion of the Coldstream Guards was based at Morlancourt, about 7km south of Albert, where they spent a week in training and practising for an attack on enemy trenches. On 9th September the battalion marched to billets in ‘Happy Valley’, which acquired its name because it could not be seen from the German front lines. Five days later the battalion arrived at Ginchy, about 2 km south of Flers and close to Delville Wood, in preparation for a major attack the following morning. This offensive from 15th to 22nd September became known as the Battle of Flers-Courcele e and was the first me that tanks were used in large numbers in battle, heralding a new era in warfare. However, the two tanks that should have been at the front of the 1st Battalion’s attack never arrived. The battalion suffered heavy losses and the Harrow Memorial states that ‘he (Lieutenant Grissell) was killed by a German hand-grenade after reaching the second objective in the Guards’ advance.’ The war diary reports that on 15th September ‘the Battalion went into attack with 17 officers and 690 other ranks and came out with 3 officers and 221 other ranks’. Francis Grissell’s body was never recovered and he is commemorated on the Thiepval Memorial along with 72,000 other men. The action in which Grissell fell on 15th September 1916 was fought out near Ginchy on the Somme, the Coldstream Guards sustaining casualties of 40 Officers and 1326 other ranks. The engagement was subsequently featured in The Illustrated London News of 18 November 1916, an artist’s impression of the Coldstreamers (or “Lily Whites”) pressing forward under heavy machine-gun fire being accompanied by the following text. 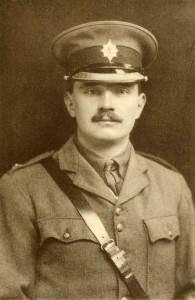 Lieutenant-Colonel J. V. Campbell, D.S.O., of the 3rd Battalion, Coldstream Guards, who rallied his Guardsmen with a hunting horn, and led them to the sunken road (Flers Road), was awarded a well-deserved V.C. In 2004 Francis Grissel’s medals were sold with others from his family including a copy M.C., G.V.R. and 1914-15 Star trio, the latter with erased naming, mounted as worn, with related set of dress miniatures, in old leather case, the whole attributed to the recipient’s brother, Lieutenant-Colonel T. de la G. Grissell, Suffolk Yeomanry, attached Suffolk Regiment. 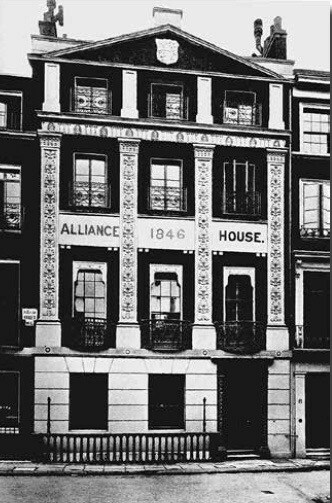 At the time of his death, according to his probate record, Francis was living at 7 Adam Street, Adelphi, Middlesex. This area near The Strand, in what is now Central London, was designed by Robert Adam and his brothers in the early 1770s and Francis, as an architect, must have appreciated the characteristic Adam style. In his will, he left an estate of over £53,000, of which £500 was bequeathed to the Library at the RIBA. He was not married and had no children.